FaceBook is the most exciting, popular and lovable social networking website where we meet our friends, update our status, upload pics and videos. Its very interesting having friends from different origins and country, I love to add some known and unknown persons in my friend list but sometimes I feel very bad when someone removes me from his friend list. So I want to tell you the perfect and easy solution for this kind of problem. Now, Mozilla has introduced a new extension called Unfriend Finder that helps you to find who removed you on Facebook from their friend list. Basically, Unfriend Finder is a simple script that provides all its users to know which one of their friend removed them in notifications after installing the Mozilla add on. One the script added, you will be able to discover which of your contacts are your old “friends” virtual. Please read the following instructions and descriptions carefully to get Unfriend Finder to work along with Firefox. 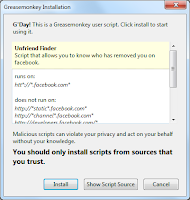 To add Greasemonkey to your Firefox click here. Validate by clicking on "Install now", and restart Firefox. Greasemonkey is installed, and you should see a smiling brown monkey head in the top-right corner of Firefox, next to the search bar. 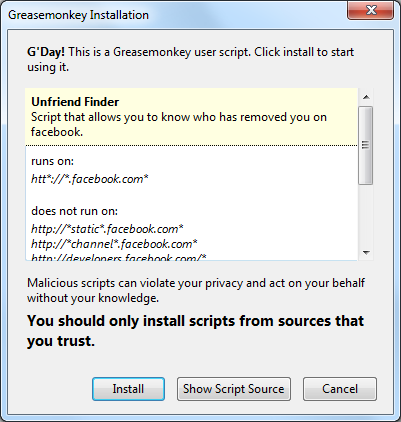 Now, close all your Facebook tabs to install Unfriend Finder. Now click Here to Download and Install Unfriend Finder. and you will get the following window. Click Install, and this is it. Now re-open your Facebook Account, Unfriend Finder is installed with your facebook account at right top corner.